BUSINESS EXCELLENCE Awarding S U P P L E M E N T T O T H E W I N N I P E G F R E E P R E S S | S a T U R D a Y , O c T O b E R 1 9 , 2 0 1 3 REAL VOTES. REAL WINNERS. 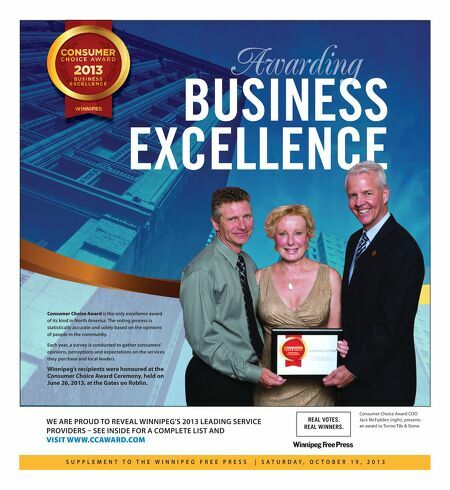 Consumer Choice Award is the only excellence award of its kind in North america. The voting process is statistically accurate and solely based on the opinions of people in the community. Each year, a survey is conducted to gather consumers' opinions, perceptions and expectations on the services they purchase and local leaders. Winnipeg's recipients were honoured at the Consumer Choice Award Ceremony, held on June 26, 2013, at the Gates on Roblin. WE aRE PROUD TO REvEaL WINNIPEG'S 2013 LEaDING SERvIcE PROvIDERS – SEE INSIDE FOR a cOMPLETE LIST aND visit www.CCAwArd.Com Consumer Choice Award COO Jack McFadden (right), presents an award to Torino Tile & Stone.